America’s Civil War was indeed a case of Americans fighting Americans. 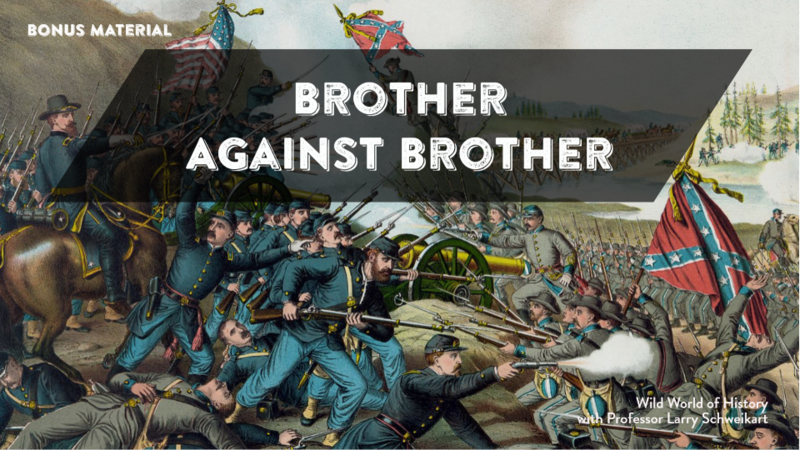 Stories of “brother fighting brother” were more than fictional inventions. Mary Lincoln’s three brothers all died fighting for the Confederacy, while Varina Davis (Jefferson’ Davis’ second wife) had relatives in blue. John Crittenden’s sons each held the rank of colonel, but in opposing armies. David Farragut, the hero of Mobile Bay, with his memorable war cry, “damn the torpedoes, full speed ahead,” had lived in Virginia, and Lincoln himself was born in Kentucky, a slave state. Robert E. Lee had a nephew commanding a Union squadron on the James River. Union General George McClellan preferred letting the South go; Sam Houston, the governor of Texas, had wanted the South to stay in the Union. As a young boy, future presidents Theodore Roosevelt (New York) and Woodrow Wilson (Georgia) prayed for divine blessings, but Roosevelt for the North and Wilson for the South. Prayer played a prominent role for both the Union and the Confederates, both of which at one time or another thought God was “on their side.” At the outset, both sides expressed the belief that the war would be short. A Richmond paper boldly predicted that “President Davis will soon march an army through North Carolina and Virginia to Washington.” Yankees, naturally, assumed that their more professional army and economic prowess would crush the South. But the Confederates thought that the “rightness” of their cause would enable the Rebels to defeat larger numbers of northerners. Christian churches reaffirmed to each side that their position was correct. Presbyterians and Baptists split legally, while other denominations fractured in practical terms. Even the Lutherans, the Episcopalians, and the Catholics while “successfully avoided public debates and voting splits,” still disagreed—sometimes violently—over the nature of slaves and slavery. Certainly both sides had devout and faithful men in positions of command. “Stonewall Jackson,” the epitome of a “hard-shelled Baptist,” once told a captain that “my religious belief teaches me to feel as safe in battle as I do in bed. . . . God has fixed the time for my death.” On one occasion, Jackson pleaded with God to “baptize the whole army with His Holy Spirit,” and personally directed wayward officers to attend camp meetings. Robert E. Lee, had a well-deserved reputation as a man of faith, praying with his soldiers and at every point, reminding anyone who would listen that God had His own purposes, regardless of what Lee, or Virginia, wanted. Soldiers wearing blue possessed no less degree of faith. General O. O. Howard, the “preacher-general,” would later take his faith to the South under Reconstruction, then to the frontier, where he believed in treating the Indians with dignity and honor. It all stopped at the top, of course, and despite depictions of Lincoln as only marginally religious, the President not only knew how a Christian personally should live, but how a Christian nation should act. Far more than Lee, Jackson, Lee, or malignant abolitionists such as John Brown and William Lloyd Garrison, Lincoln recognized that slavery was a national sin that could not be compounded by the sin of lawlessness. Whatever actions needed to be taken, Lincoln maintained, they had to occur “in order,” with both the letter and the spirit of the law in mind. J. William Jones, Personal Reminiscences, Anecdotes, and Letters of General Robert E. Lee (New York: D. Appleton and Co., 1874).